Top-level menu items (File, Edit, View, Help, etc.) can have a GtkAction associated with them. The action is activated when the user clicks on the menu item to display the dropdown menu. Under vanilla GNOME, this works fine today. Under Unity, the toplevel menu action is not fired when the user clicks on the item. This leaves our menu in its initial state no matter what the user does (i.e. they select a photo but none of the Photos items are sensitive). Need to move it over to next week as ted has some work to do in indicat* to make this work. I can confirm this as well. The menu works fine unless I am using the appmenu. Change description: The change is to allow applications using a particular kind of dynamic menus, like Shotwell, to have their menus properly exposed on the new panel menu. Rationale for the exception: Without the change, all of Shotwell's menus are displayed and active, whereas only a few of them should be present. Without the change, the UI of Shotwell is severely impacted. 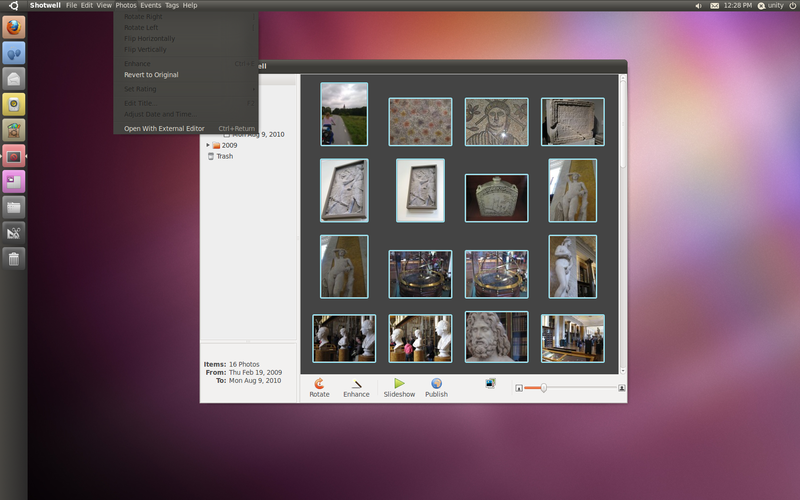 Shotwell is the default photo management application for Ubuntu Maverick. Additional information: the change requires fixes in several packages like unity, dbusmenu or libindicator; the libindicator change creates an ABI incompatibility as we ran out of free function slots in the object interface; this change in turns requires a rebuild of all indicators (~25) but not applications using the app-indicator protocol. To clarify David's comment, I think he has a typo. There is roughly 8 source packages, not 25. It should only require rebuilding indicator-session, indicator-application, indicator-me, indicator-datetime, indicator-sound, indicator-messages, indicator-applet and unity. And indicator-network in universe. This indeed is a nasty issue, and 8 rebuilds (of small packages) sounds feasible. Please go ahead. Adding also awn-extras which have indicators support. - Install apport hook only on Ubuntu. - Build-depends on lsb-release, needed to detect the distribution. - From upstream, fix icon in desktop file of mail applet. * Set the LANG before running oem-config-remove. * Prevent a crash of debconf-communicate when removing oem-config. entire prepare page to fail. so that we get translated descriptions (LP: #646109). setgroups() as a regular user (LP: #646827). I'm still seeing this problem on Ubuntu 10.10 with all the latest updates as of September 27. Many Shotwell menu items are not available when they should be, making Shotwell pretty much unusable on Unity. This is working the way that I think it should... could you post a screenshot as I seem to have the items disabled now. Perhaps I'm not understanding what I'm looking for. The problem is that if you select photo(s) in Shotwell, most/almost all of them items in the Photos drop-down menu remain inactive. They should be active when photos are selected. I've attached a screenshot showing the problem. All of the items in Photos should be available at this point (because some photos are selected).